I have made this card from regular cardstock (an A2 regular size card). I cut the frame from my very first set of spellbinders that I bought last week. I used a piece of vellum paper embossed with Cuttlebug swirls die folder. I also used a few small flowers from Michaels and a sheer ribbon. I also used a bird die cut for embellishments. I know my mom will love this card assets love her lots. She will be 87 this year. 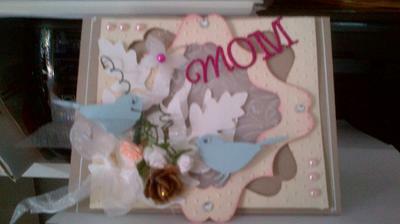 This is a very pretty card for your mum and I am sure that she is going to love it. This is the day that we can all go to town and make the prettiest cards we can because all mum are special and need to know that we care about them. Join in and write your own page! It's easy to do. How? Simply click here to return to Special Occasions..